LET US LOVE ONE ANOTHER…. There have been, of course, hundreds of powerful images, and responses to the unthinkable tragedy of this week’s bus accident. 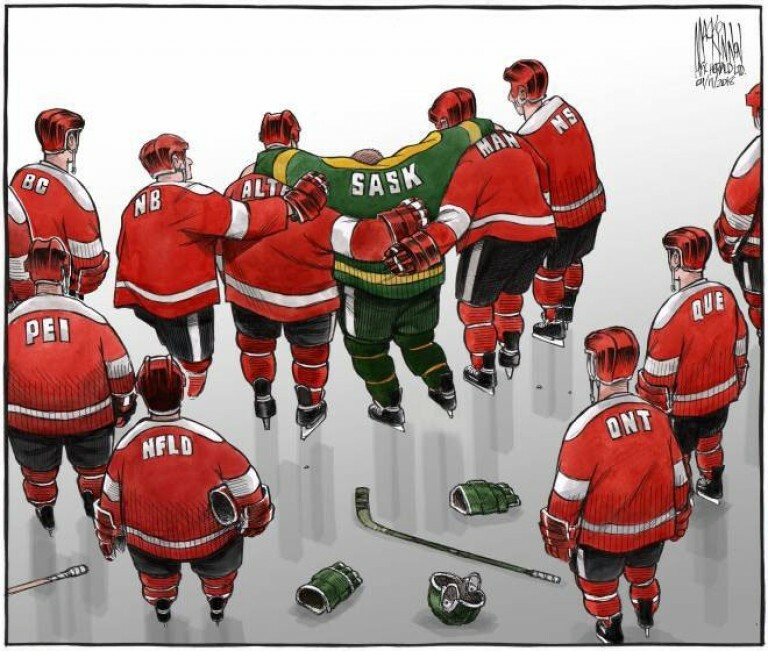 As a long-since-retired hockey player myself, I did find this one particularly touching. It reminds us that even those who play a game that can be very angry and violent in moments, can & do rise to a higher version of themselves in those moments when one of their brothers or sisters in the game are injured or knocked down. Somewhere in that alone is a sermon about what it means to both be swept up in the passion of life AND STILL hold onto our human decency and call to love. The pastor in me though, was even more touched by it. For indeed it is a powerful depiction of what has happened in our families, among our friends, and yes even across our country as the waves of sorrow so many people are struggling to deal with wash over us. Here again I do find it inspiring and renewing to see that so many of the geographical/political/ethnic/sociological differences among us have been transcended by a deep need to care for each other in this terrible time. Just so, to keep track of the financial contributions that have flooded in is almost breathtaking. It is both a reminder of how connected we are and how tragedy can pull out our (too often underused) capacity for compassion and tenderness. Indeed we continue to pray for the all the people and families who have been directly affected by this awful accident. Just as we continue to pray for those young men who have survived the accident and will now have to spend many months and years recovering from their physical and spiritual wounds. And finally we likewise pray for all those people for whom this event has brought up their own history of hurt or fear. For each and all it is our deepest longing that the promise of God’s resurrection and the tenderness of God’s living care for us will give them hope and peace. May we also pray though, that this renewed sense of connectedness and compassion for each other will take its strong root within us. May our renewed sense of being ready to feel with and care for each be - not just for this moment but… - again the character and witness we live every day in our lives! !